IGVC - The Intelligent Ground Vehicle Competition brought ~40 teams from various universities and tech schools around the world to Traverse City, Michigan. The competition consisted of three parts: an autonomous challenge, where the robot navigates itself through an obstacle course using vision and other sensors, a navigational challenge, where the robot uses GPS to hit multiple way points in the shortest time while avoiding obstacles, and a design competition. 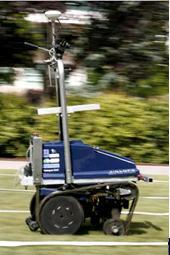 BYU entered for their first time in 2005 and took fifth in the autonomous challenge, the biggest of the three challenges. BYU took the third place in the design competition in 2006. The experience was a great one for all those involved. Copyright © 1994-2013. Brigham Young University. All Rights Reserved.